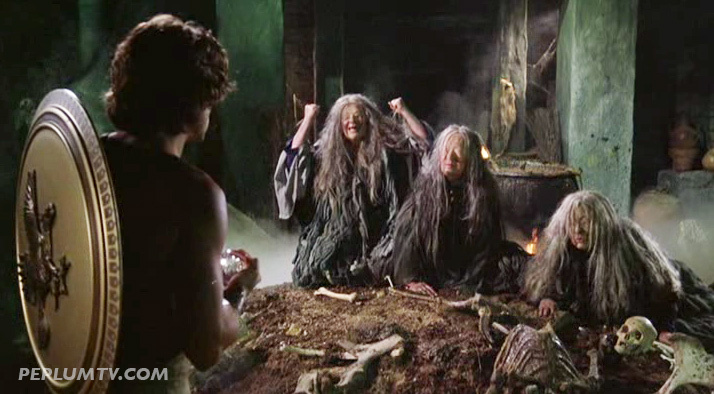 The three witches are blind and they use a crystal ball as an 'eye' to see their surroundings. These ugly, cannibalistic gals are very wise too. They are the ones who inform Perseus on how to defeat the Kraken, with the Medusa's head. Good scenes. Flora Robson, Anna Manahan and Freda Jackson are the Stygian witches. This was my first introduction to mythology on film, and I couldn't have hoped for a better one. I know Clash of the Titans has its detractors, but I find it exciting and atmospheric. The Medusa scene is one of the best realized pieces of fantasy on celluloid.